Understanding the difference between poor performance, misconduct and serious misconduct – and what steps need to be taken for each type. Performance improvement plans – how they work, templates to use, how to put them in place and how to deal with the challenges that can come up. Giving a warning – how to work through a disciplinary process, the letters to write, how to hold the meetings, the fish hooks that can trip you up and the challenges that can occur when making a decision and telling the employee. Dismissing an employee – the letters you must write, what to say and do in the meeting, how to deal if things get nasty and how to end employment. 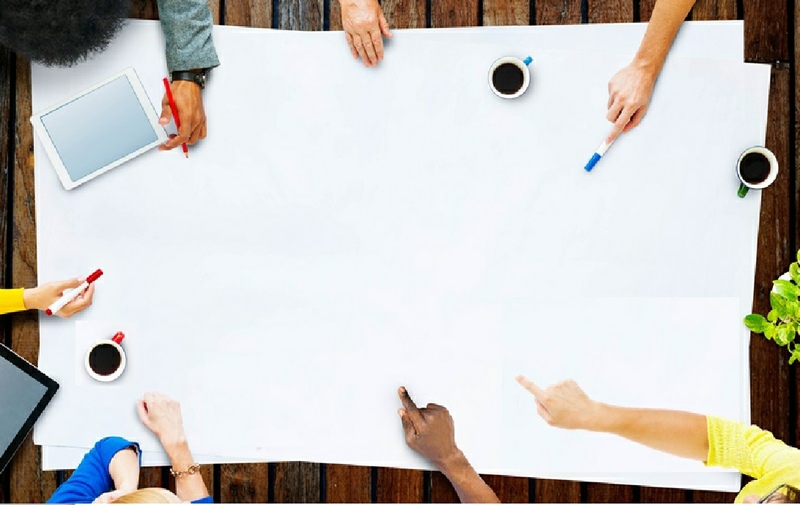 During the workshop we’ll work through a number of case studies, so that you will get experience investigating an issue, reviewing and rewriting disciplinary letters so they are legally correct, seeing different disciplinary meetings happen and analyse what the outcome should be, considering the factors for dismissal and watch a dismissal discussion happen. You’ll get a comprehensive workbook packed with templates and tools that you can then use in your business, discuss how this applies across a range of different situations and get answers to any questions or concerns you have. If somebody stole or defrauded your company and you dismiss them, why should they be awarded thousands of dollars in compensation? Simply because the process followed wasn’t fair and reasonable. So many companies issue employees with warnings or dismiss them, only to have the employee take a Personal Grievance and be awarded large amounts of compensation, even if the decision to dismiss was the right one. It all comes down to the steps you take during a disciplinary process to ensure you act in good faith. The steps are not difficult once you know them, but there are a number of issues and fish hooks at each step that can trip you up. Once you know these, you’ll be able to always make sure you follow the right process to get the right outcome – and have no Personal Grievance claims. The good news? 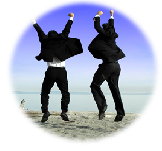 Elephants Disciplinary and Dismissal workshop covers exactly that and gives you practical tools and techniques to put in place in your business. Our employment law training always receives fantastic feedback from those who attend who say that they get real value from getting answers to all their questions (however strange or unusual!) and really enjoy the whole day as well as learning lots. Our facilitators all have significant experience in employment law but also how to apply it to many and various situations - so can share how it works in real life. Nikki Peck has over 20 years of generalist HR experience working in diverse sectors such as health, engineering, utilities, retail and not-for-profit. 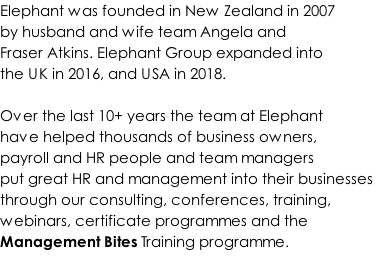 Nikki has a Post Graduate Diploma in Human Resources from The University of Auckland and joined Elephant in 2012 as an HR Consultant and facilitator. She always receives extremely positive feedback from managers and HR people for making any workshop she runs interesting, entertaining and extremely useful - sharing practical real life examples and answering curly questions. Why are Elephant workshops different? We know there are a lot of boring workshops out there that give you a lot of theory, but not a lot of practical tools you can really use – and often presented by someone who hasn’t had to dismiss anyone themselves. Our workshops focus on giving you tools and resources you can use in real life, with lots of discussion about how they apply. And our facilitators are all awesome and have significant HR experience so know what they are talking about and can share real life examples with you. Liz Tibbutt started her HR career after chucking in the towel (literally) on her 12 year career as a chef. After several years in Corporate HR at Air New Zealand, Liz moved to London where she focused on recruitment and HR project management. She also completed an MBA from Henley Management College. But the new millennium called Liz home and she spent the next 12 years as a contractor and consultant in a wide variety of industries and sectors in NZ and Australia. She is passionate about digital technology, HR data, change management & research. Liz also runs insideHR – a website that brings together the latest HR news relevant to HR professionals in New Zealand. Liz joined Elephant in 2019. You may also be interested in our one day Essential Employment Law that runs the preceding day to this workshop.